Beautiful work, Pam! You should also check out my new book Mixed-Media Self-Portraits for further inspirationa and techniques. Send me some of your work! Hmmmm… Queen for a day….I may have to grant everyone I know three wishes and maybe even toss a few in the dungeon for safe keeping! The crown is truly fantastic…the image is royalty. As always, love your journals–and the Queen is so fitting for you 🙂 My idol!! Good for you, doing a face! And it is wonderful, just very accomplished. I never would have thought of starting with a stamp, that was quite clever. 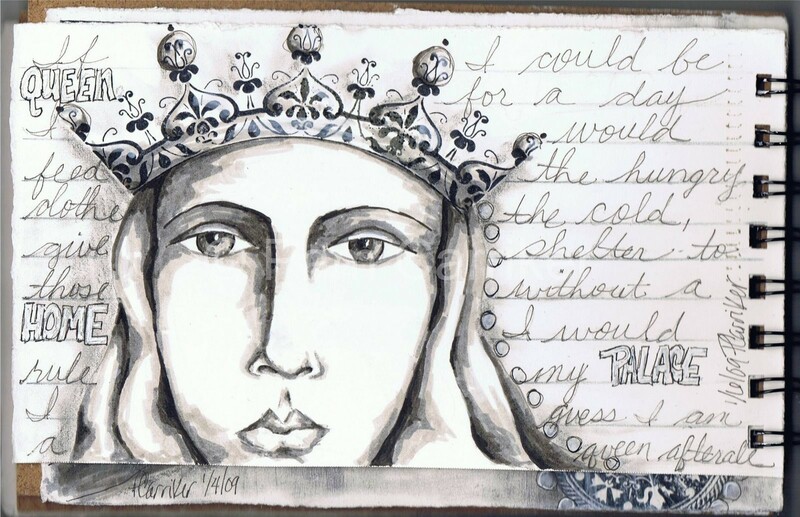 Pssst…You ARE the Queen, of journaling! I like this and how your image grew from a stamped design. I’ll have to try that.